Longtime friend of Pokerati and poker pro Gregg Merkow took a rough beat early yesterday morning when fire engulfed two of his restaurants in Dallas. A four-alarm blaze destroyed The Hurricane Grill and the Greenville Bar & Grill, owned by Merkow, along with Mick’s bar and Terilli’s, the Italian restaurant where the fire reportedly started. It’s one of the most historic blocks of Dallas nightlife on Greenville Avenue — and thus citizens are concerned about saving what they can of the buildings even after they burnt virtually to the ground. More on the fire and its aftermath here. Because we care about poker players, and due diligence, we’d throw our friends under the bus in a second for a scandalous hedline + Google juice, we couldn’t help but ask whether or not perhaps he’d been running bad lately and this fire, started at a time when the structure was safely empty, might not have been a nefarious play for insurance dollars. Turns out that Merkow didn’t even have insurance on these legendary properties that may or may not have helped launch a poker career. Today is the first day of the 2009 main event. I’m sticking to my guns and saying the field size will be anywhere from 3,000-12,000 and offering 10:1 odds on anything outside of that. Just made a wager on the over for 5,000 … easy. Anyone else wanna offer that line? Seriously, it’s such a wild guessing game, and yet in the end, why do I think it’s gonna be just a few hundred less or just a few hundred more than last year’s main event field of 6,844? People can get their money off of PokerStars, right? Winner winner chicken dinner won my seat to the main event in mega sat. today but can’t decide what day to play fri,sat,sun or mon. Good question. Though as Kevin points out the numbers will likely differ noticeably as the 96 hours that constitute Day 1 progress, is there really a difference in the types of fields you can expect on each day? One more donkey-filled than another, for example (and is that a good or bad thing, lol). Choosing when to play, of course, is the first of many decisions that will be part of someone’s journey toward becoming the winner. But it may also be the least relevant and simply depend on the player and his or her life schedule. You get the gist. The numbers don’t lie repeatedly. 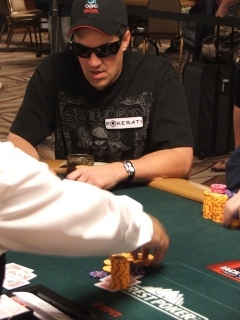 So while “playing some of the best poker of my life!” … not only is the DonkeyBomber something like 0-for-13 in cashing in tournaments, but also he hasn’t even made a Day 2. So before he finds himself trying to trade jewelry with Eskimo Clark for a satellite buy-in, he has decided to change his game says he will no longer be twittering until he bags chips for the first time in the 2009 WSOP. Good gameplan. Click here to see the beginnings of a first-half WSOP fail regaled in increments of 140 characters or less. We’ll see if Tom returns with a vengeance or if his twitter account, along with his poker career, fades into oblivion. The face of a Team Pokerati player about to lose all his chips, just in time for the cameras. A few minutes later, I walk over that way to buy Benjo a drink to grab a picture of our latest Team Pokerati money player, and I stumbled onto a hand that looks to be getting big. Sure enough, they’re playing 7cs-hi-lo, and Poels is about to be all-in with the nut-flush and nut-low draw, and two cards to come. His opponent has trips … Pat goes blank-blank … and just like that he’s out — in 47th place, for a $5,277 payday. Gregg Merkow busted out in 9th place, fewer than five minutes after posing for a picture with his new Team Pokerati patch. 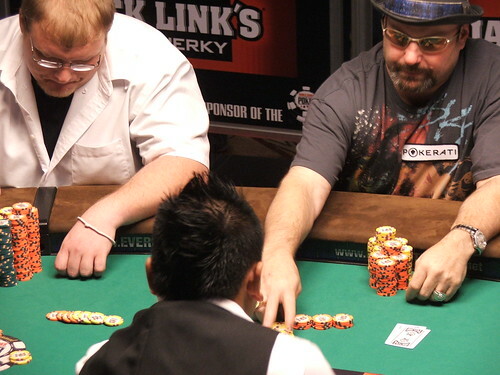 UPDATE: @donkeybomber just busted out of his second tournament of the day — $10k 2-7 NL-1D. He’s still 0-fer, and has yet to go deep enough to display his ‘ati affiliation. + Go Gregg Merkow, too! I’ve got a horse in the ladies event … Gabriela Hill, whom you can follow at @GabrielaHill. She’s not a Pokerati patch-wearer (yet) or anything, but I was the lone media representative to accept the very odd offer from her disgruntled former agent, @OliverTse. Seriously, it was a strange prop bet offer … one deemed “unprofessional” by some, and made one other refer to Oliver as the Kim Jong Il of Poker. Though Oliver is Chinese, not Korean, the metaphor kinda sorta holds … because by all means he is sometimes an ostracized “player” in the industry, left to his own devices … and let’s face it: the guy would presumably love to get his hands on some nuclear weapons and wreak havoc on all who ever have tormented him since high school. I’ll share with you more details of the wager itself as I learn to understand them. But basically – and these are the odds that just seemed too good to pass up on my end — if she’s still alive by the time I show up at the Rio, I’ll get my $10 back. If she makes it to the final table, I get $1,000. There are all sorts of other increased payment tiers along the way. Though she probably doesn’t remember it, Gabriela Hill and I actually met last year — Oliver introduced us. At the time he told me (with extra emphasis on the rolled R’s) that she was a hot Latin American player. Good enough for me! This is her first ever WSOP bracelet event, apparently. Go Gabi Hill! You the girl! Meanwhile, as Gabriela’s working on building her stack in a way that makes Dan money! justifies her trip to another continent, we’ll also be following Gregg Merkow closely, as this longtime Pokerati fan — wielding a bankroll fueled at least in part by the high-roller contingent of Batfaces — has his best chance for a bracelet in as long as we can remember. He’s the chip leader with 18 players left in $2,500 NLH. The short stack going in there, btw, is Phil Ivey … who hasn’t even showed up yet, but has already outlasted three players who started the day. Click here to follow that action. UPDATE: Merkow went out 9th. 🙁 We swear his donning a Pokerati patch and the subsequent cooler effect was purely coincidental. UPDATE: Supposedly Gabi is out, too. 🙁 I hope you’re happy, Oliver! Congratulations go out to Anthony Harb who took down the $2,000 NL Holdem event for $569,254 earlier this morning, outlasting Peter Rho and Jim Geary. All three players had cashed in earlier events in the WSOP as Harb and Rho cashed in the $1k NL Stimulus Special), while Geary finished 7th in the $1,500 OHL event. Onnittelu to the first Finn to win a WSOP bracelet, as Ville Wahlbeck, who had an earlier 3rd place finish in the $10,000 7 Card Stud World Championship bested David Chiu in heads-up play to take home the bracelet that eluded him earlier in the week, collecting nearly $500,000. He also moves into the lead in the WSOP Player of the Year race with 160 points, ahead of Phil Ivey and Vitaly Lunkin’s 110 points. Another Finn looking for some glory of his own will be Tommi Horkko, who is the chip leader (509,000) with 11 left when the $2,500 Limit Holdem 6-max event gets underway at 1pm today. Daniel Negreanu (470,000) is close behind in 2nd place. Barry Shulman, Brock Parker, Shawn Buchanan and Nikolay Losev are the more notable names remaining in the compact field. The $2,500 NL Holdem event will also return at 1pm today with 20 players returning to play down to a winner. It”ll be like the Ross Perot v Al Gore debate all over again as Texan Gregg Merkow starts play as the chip leader (932,000), with Mexico’s Angel Guillen (860,000) and Canada’s Bahador Ahmadi (800,000) are the top three stacks fighting it out in the name of free trade and poker supremacy. Other international invaders who’ll be trying to take the bracelet to their own trade zone includes the UK’s Roland de Wolfe (400,000) and Russia’s Kirill Gerasimov (390,000). Brazilian Clemencau Calixto, not to be confused with the New Mexico band Calexico, is the chip leader (186,300) at the end of day 1, as 164 players will return at 2pm. Frere Jacques Faraz Jaka is 3rd in chips at 172,200. Other notables who are in the top half of the field: defending champion Scott Seiver (118,600), Jimmy “Gobbo” Fricke (112,200), Isaac Baron (101,300), David Benefield (85,200), Gavin Griffin (69,100), Erik Seidel (65,900), and Dan Heimiller (56,200). From a field of 359, only 97 will make their way back into the Rio at 2pm to attempt to reach a final table. The day 1 chip leader is David Levi (49,600). Among those in the top 10: Dutch Boyd (47,700), Jeff Lisandro (40,700), Jason Mercier (35,000), and Eli Elezra (31,100). Other notables include: Sam Grizzle, Nick Frangos, Pokerati’s own Robert Goldfarb, and Barbara Enright. Today’s event at 12 noon is the $1,000 NL Holdem Ladies’ World Championship, which was won last year by professional Svetlana Gromenskova in a field of 1,190 to collect just over $220,000 in cash. It remains to be seen if any guys will attempt to enter the field like last year, but it’ll surely make a great photo op for someone bold enough to give it a try. The 5pm event today will be the $10,000 Omaha 8 or Better World Championship which was won last year by David Benyamine in a field of 235 to add over $535,000 to his tournament stats. Follow the updates at www.worldseriesofpoker.com and Pokerati for the other stuff. What’s happening around the WSOP while I consider a new career. Meanwhile, the $1,500 PL Holdem event is down to their final 2 tables with Brandon Schaefer, David Singer, Joe Tehan and Phillip Yeh still in action. Gregg Merkow was one of the very recently busted, out in 19th for $5,547. Play for them ends when they reach their final 9, this group will definitely be more rested for their ESPN final table. What’s happening around the WSOP while the world’s #1 Limit Holdem player is waiting for you. It’s almost 6:00am and play finished at 18 in the $1,500 NL event. They’ll be coming back at 1:30pm today to eventually get to a final table, broadcast for ESPN. Theo Tran appears to be the chip leader, while Chris Ferguson, Minh Nguyen, David Bach, and Perry Friedman are still in the mix. Two new events go underway today, but expect more attention being paid to the $1,000 NL holdem w/rebuys event, starting at 12 noon. The two NL w/rebuys events averaged a combined 3,000 entries/rebuys, expect more of the same today. Daniel Negreanu has not had a good Series so far, expect him to be rebuying heavily today. For the non-holdem fan, the $1,500 Limit Omaha Hi/Lo 8 or better tournament will start at 5:00pm. Ed. Note: This post woulda been much more relevant and timely had it gone up yesterday, when it was written. Despite slightly lower numbers, the WPT World Championship will still likely end up being one of the five biggest tournaments in the Milky Way this year … and Day 2 has just gotten underway. Pokerati would love to beyotch about not having access to the makeshift WPT TV studio at Bellagio to do our brand of non-chip coverage, but we’ve been invited to a WPT Party tonight with free food and booze, so we’re obviously all good with the status quo. 421 of 545 starting players remain … A few names that I’ll be paying attention to for various reasons, and where they stand in relation to their starting 50k chipstack include Carlos Mortenson (defending champ – 172,075), Tom Schneider (25,400), Clonie Gowen (93,975), Gregg Merkow (40,075), Nenad Medic (12,425), Rodeen Talebi (18,000), Ray Henson (89,550), and David Sklansky (41,050). Click below to see how the whole pro-studded field shaped up as of noon-Pacific today, and click here to follow the action throughout Day 2. Just got word over the poker satellite that Gregg Merkow and Jamie Gold are currently engaged in some high stakes action — $50/$100 NLH with a $200 straddle. I can only presume in Tunica, where there’s a WSOP Circuit main event and a big WPT event going right next to each other. Don’t know who’s got what kinda stacks in front of them, but you know who we’re rooting for … 2008 baby, it feels good to run good! UPDATE: Webber is out. Now playing 5/10 nlh. LAS VEGAS–Paul “Eskimo” Clark was playing in the $2,000 7-stud Hi Lo event today … Dallas pro Gregg Merkow was at his table, and it was two chips for Eskimo to call. He threw in one, and then sorta froze. After some seconds lapsed, players started trying to recapture his attention, letting him know he needed to throw another chip in the pot. That didn’t happen, and soon the other players at the table were helping him to the ground, where he lay as the tournament was stopped and medical help was summoned. So not to be crass — because of course we hope he is recovering, as surely plenty of players who have fronted him do, too — but what happens to a player’s chips in this situation? Clark had about 4,275 when the apparent stroke happened. So when it was clear he would not be back anytime soon, floor staff removed his original 4,000 chips from play, and then anted off the remaining 275, so the table would not be at a disadvantage. Word is that the WSOP also refunded his buy-in. One of my favorite restaurants in Dallas — Merkow’s — has closed. It will apparently re-open as the Greenville Bar & Grill. Bummer. I kinda dug the casual upscale culinary thing, especially when done by a guy with a very Vegasy palette. I want to start by thanking you for your patronage and would like to inform you that Merkow’s has officially closed and will be reopening soon as Greenville Bar and Grill. In the mean time, Chef Barry will be moving over to Hurricane Grill. We look forward to seeing you soon. I hear ya, Merk. But I thought your name was spelled with two g’s at the end, yo? Same event he won last year. TunicaÃ¢â‚¬â„¢s Main event. Maybe IÃ¢â‚¬â„¢m wrongÃ¢â‚¬Â¦ I really thought youÃ¢â‚¬â„¢d know more about this than me. IÃ¢â‚¬â„¢d hate to slip, but I think heÃ¢â‚¬â„¢s onto something huge. Which event? Is this the same event he won last year or something like that, or did he win won last week?